The Boardgaming Way Who Lost Waterloo? 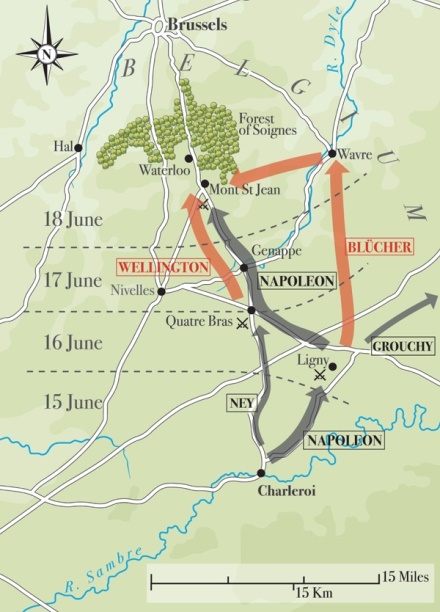 Napoleon was confident that he could defeat the Prussian army at Ligny on June 16, 1815, and then go on to defeat the combined Allied army under Wellington the next day. 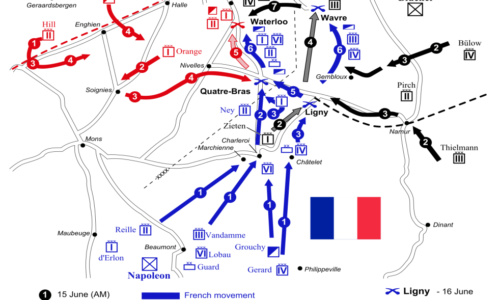 While the events at Quartre Bra and Ligny on the 16th, and the day of reorganization on the 17th, lead to the ultimate defeat at Waterloo on the 18th, where should the blame for this crushing loss be placed? 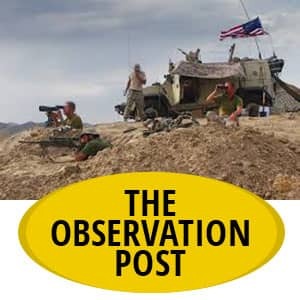 Is it Napoleon’s poor judgment and his lack of clear orders to his subordinates that caused the problem? Is it Ney’s lackluster performance on the first day that allowed Wellington to take a strong position? Was it Grouchy’s poor command skills and his failure to march to the sound of the guns that ultimately lead to the French forces being routed late in the day at Waterloo? First, let’s look at each of the major commanders. 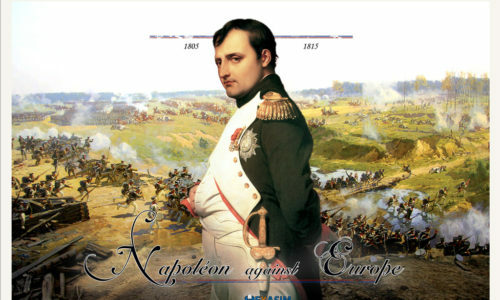 Obviously, Napoleon was the Emperor and the overall commander of the French army. 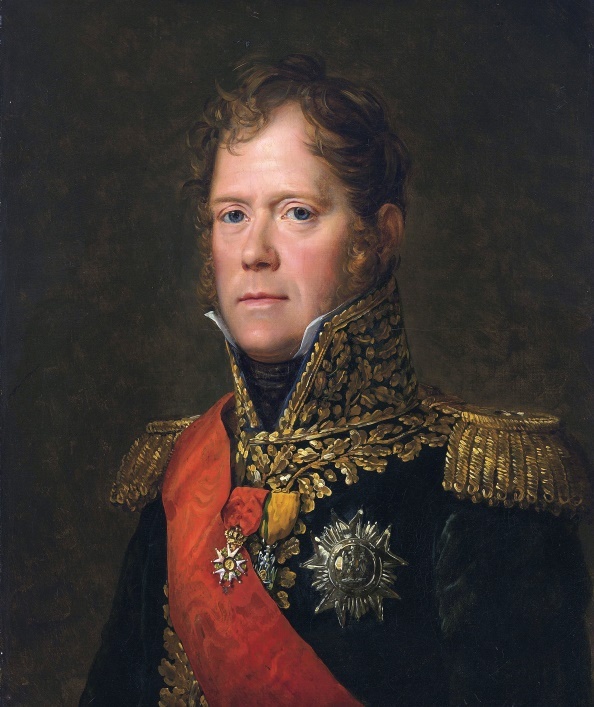 But for most of the 15 years prior to 1815, Marshal Berthier was Napoleon’s chief of staff where he translated his commander’s garbled, sometimes imprecise, requirements into clear and easy to understand orders. When Napoleon returned to France that spring, Berthier who was living in Bamberg in Saxony at the time, tried to rejoin him but was stopped at the border and returned to his castle in Bamberg, where he was murdered on the orders of the Comte d’Artois. To make matters worse, Napoleon had never decentralized his command or set up a staff system as his generals were expected to follow his orders to the letter. Moreover, Napoleon did not trust Marshal Soult and worried about leaving him in the capital where he could cause trouble or change sides again. Therefore, he appointed Soult to be his new chief of staff. A job that he was not prepared for or even wanted, which resulted in much of the French armies orders being poorly written. In fact, many of Napoleon’s problems can be directly traced to the poor staff work of Soult. In addition, during the Waterloo campaign, Napoleon lacked his best fighting and independent thinking Marshals. Lannes had been killed in 1809, Davout was needed to defend the capital and Suchet and Brune were given other commands. 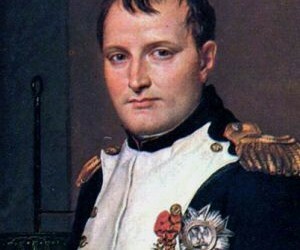 Napoleon apparently felt that he needed to show his generals that he could still reward or demote people who showed leadership or the lack thereof. For example, he made Grouchy a Marshal and took the baton away from Marmont, Augereau, and Victor. He gave corps leadership to Reille, Vandamme, and d’Erlon, hoping that they would become Marshals at a future date. As Marshal Ney was a trusted battle-hardened leader, he was given command of the left wing of the Army du Nord (about 30,000 men). This was necessary as Napoleon needed to coordinate the two wings of his army he had separated on the evening of the 15th of June. 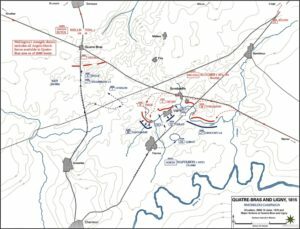 Therefore, Ney was sent to take the key crossroad of Quatre Bra from the Dutch and English forces, while the Emperor accompanied the larger portion of his army to a position outside of Fleurus. 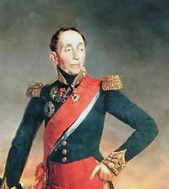 Around 4 a.m. on the 16th, Marshal Ney was trying to close up his ranks. French General D’Erlron was below Jumet with 2 divisions. General Allix was still crossing the Sambre by 5 a.m. General Reille, on Ney’s orders, had sent Bachelu’s division up to Farsnes in support of General Lefebvre-Desnouettes’ cavalry. However, Marshal Ney was never given exact orders as to which troops were to be sent to aid Napoleon in his fight with the Prussians, nor was he given a time as to when to move these troops. As things developed Napoleon expected some of Ney’s men to arrive on his extreme right during the afternoon. These fresh troops would then deliver the decisive blow to the Prussians, who would have no choice but to retreat. At 2 p.m. Soult sent a message to Ney informing him of the then imminent battle at Ligny and giving Ney general orders. Marshal Ney received Soult’s first message of the afternoon before British General Picton’s division entered the fight. Ney may have sent a message back to Napoleon that all was going according to plan. He was forming up General d’Erlon’s corps at Frasnes. It would be available for transfer to Napoleon, but Soult’s note did not indicate any sense of urgency or danger in Ney’s mind. 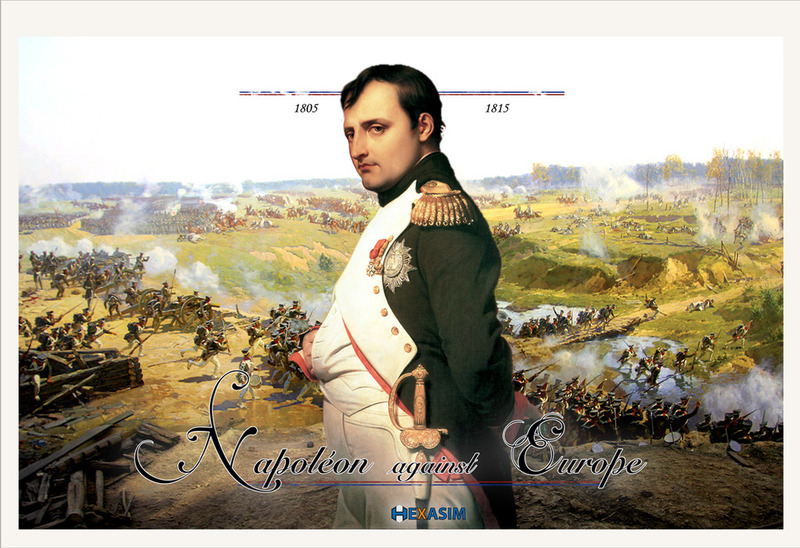 Ney felt confident that Napoleon had more than enough men to defeat a single Prussian Corps. Ney was probably shocked to receive the second letter from Soult at around 3:15 p.m.
Evan so, Ney was not getting a true picture of the events unfolding around Ligny. He had no way of knowing that his lack of response to the orders sending a portion of his troops in support of Napoleon was to be critical in the outcome of the battles. Napoleon at the same time was thinking that Ney could handle things against Wellington without any help from the right wing. Napoleon, therefore, sent orders directly to General d’Erlon to move his Corps to S. Amand. 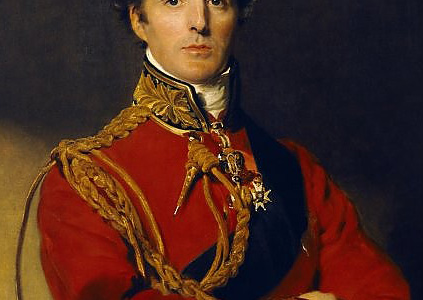 These orders were transmitted by the Imperial Aide de Camp, General le Comte de la Bedoyere. When Bedoyere reached Frasnes he found that d’Erlon was not present, so he gave the orders to d’Erlon’s Chief of Staff, General Delambre. Delambre rode forward and showed the letter to General de Salle, commander of the Corps Artillery of the French Army. So it fell to De Salle to direct the other divisional commanders to get their men moving. De Salle later recalled his confusion over the content of the order. As the afternoon proceeded, Ney was thinking that he could not afford to send d’Erlon corps to assist Napoleon. He consequently, countermanded the orders to d’Erlon and told him to return to the battle at Quatre Bra. 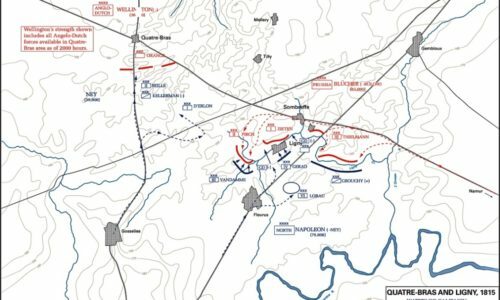 This effectively took d’Erlon’s Corps out of both battles as they spent the day marching back and forth on the same road and never appeared on either battlefield. Consequently, mistakes were made by all the parties involved in the events of June 16. Napoleon never informed his wing commanders as to the big picture. He failed to tell Ney what he expected from him until it was too late to act. 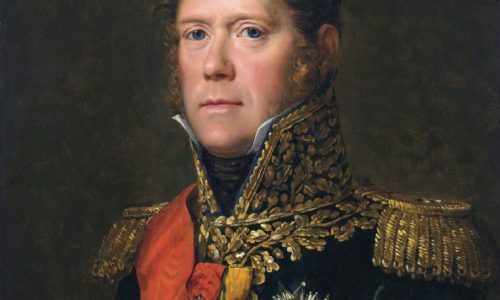 Marshal Soult wrote vague and ambiguous orders that failed to spell out what actions Napoleon wanted from Ney. Plus he transmitted inaccurate information as to the size of the force that Napoleon was facing. 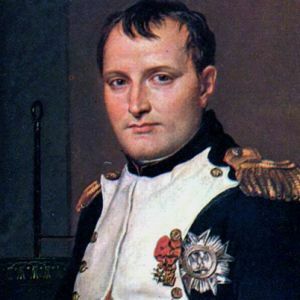 Ney overreacted to his situation, feeling that he was the more important of the two battles; he was reluctant to release the troops that Napoleon needed. In fact, Ney never grasped the overall plan for the 2-day engagement. 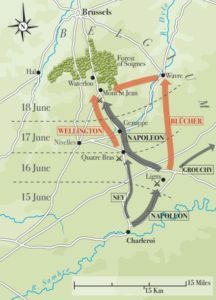 Now for a look at the events of June 17th, 1815 and how they shaped the critical battle of the next day. At the end of the fighting, at Quatre Bra, Ney did not send a report to Napoleon. There was no dispatch informing the Emperor of the outcome of the battle or the positions of the force that were involved. Napoleon was still in the dark as to these things as dawn approached. Finally, General Flahaut, who has spent the previous day with Ney, reported in person to the Emperor. Napoleon learned that Ney had not been informed of the results of the battle of Ligny. He, therefore, remained unsure of what was expected of him and awaited further orders. This alarmed Napoleon who had presumed that Ney had retaken the offensive and held the key crossroads of Quatre Bra. 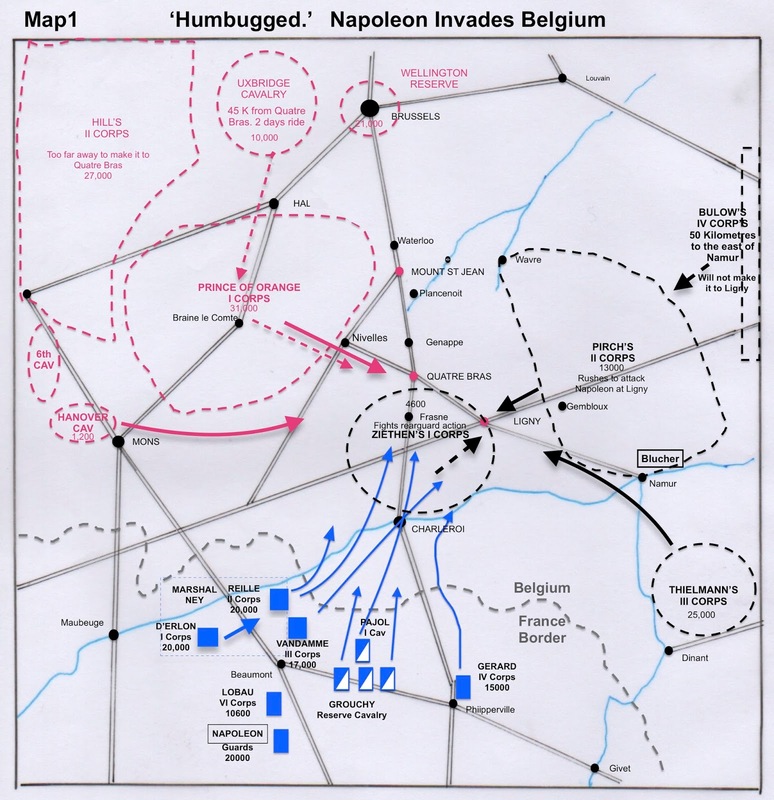 Thence Napoleon rethought his plan to march along the Namur road. 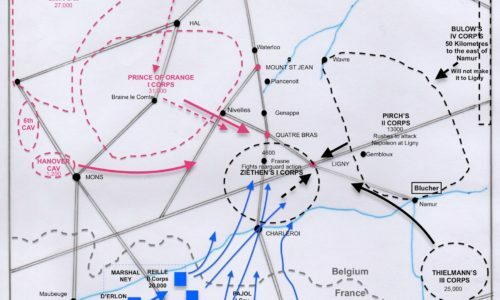 He told Soult to write to Ney to inform him of the victory at Ligny and to press the left wing to immediately attack the Allied forces to his front. At the same time, the French right wing under the command of M. Grouchy was supposed to be pursuing the Prussians as they retreated from the battlefield. Grouchy wrote in his memoirs (years later) that, in fact, he went to see Napoleon at 8 o’clock in the morning, but was told that he was still asleep. He waited almost 2 hours before he could report to the Emperor that Pajol’s forces had followed the Prussians along the road to Namur. This implied that Blucher and his large army were in retreat and retiring on Namur and Maastricht. 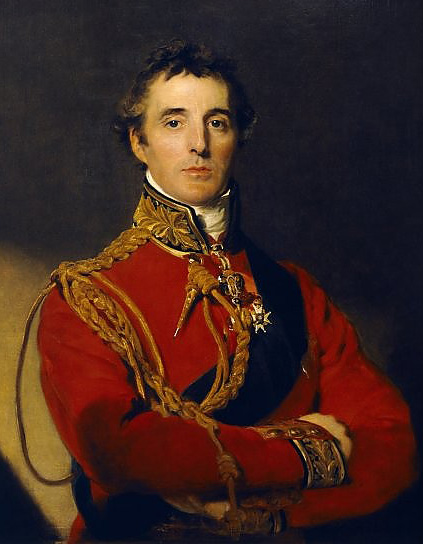 Soult even informed the Minister of War that the Prussians were going to Namur and Wellington was retreating to Brussels. Grouchy further claims that it was after 1 o’clock when Napoleon finally gave the orders to pursue the Prussians. Grouchy gave orders to his generals to march in the direction of Namur. However, he made the mistake of sending all his troops on the same road. He then compounded this blunder by telling the French general Vandamme to take the lead even though he was the furthest to the west. General Gerard had to wait until the whole of Vandamme’s corps reached him and then marched past before he could move his men out. If this wasn’t enough of a slowdown, at 2 pm it started to rain heavily, which only made the roads worse. Shortly after 3:30 pm, Grouchy received a Message from General Pajol of the cavalry, saying his scouts had reported back that the Prussians they had been following were only a few stragglers and the main part of the Prussian army had gone in another direction. As Grouchy’s aide de camp, Captain Bella brought a letter from French General Exelmans. I have the honour to inform you of the movement that I have made on Gembloux this morning, following the enemy who has massed there. I have observed them until now and I have not seen them move. The army is on the left of the Orneau; on the right of this river it has only a single battalion in front of Basse-Bodece. Immediately that it moves off, I will follow it. To summarize the events of June 17th, Ney was remiss in not sending a detailed report to Napoleon at the end of the day on the 16th. 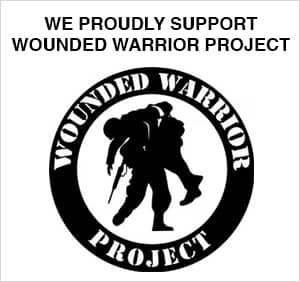 Nor did he tell his commander the outcome of the battle or the disposition of the forces. This mistake caused Napoleon to delay sending out orders for the day on the morning of the 17th, until around noon. Plus Napoleon was misinformed as to the retreat route of the Prussians. 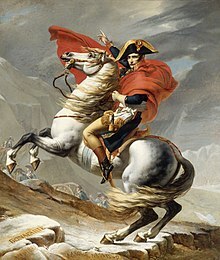 Additionally, Grouchy did not order his cavalry to pursue the Prussians until he received orders to do so from Napoleon. Of course, if Grouchy had been a more experienced commander he might have told General Pajol to be more aggressive in his pursuit early in the day. Grouchy further complicated his mistakes by not having a feel for the road network and the relative positions of his forces. “Those (Prussians) who had left Ligny after the battle the day before at 10 pm therefore had more than a fourteen hour lead on us. There was reason to think that these fourteen hours would be well employed by the enemy. He rejoined Bulow’s corps without a problem, who was 20,000 men strong (actually 30,000), and who had not been able to arrive to take part in the battle of Ligny. With these reinforcements, Blucher’s army found itself more formidable than the day before when he offered battle, from then the vanquished could defy the victor. 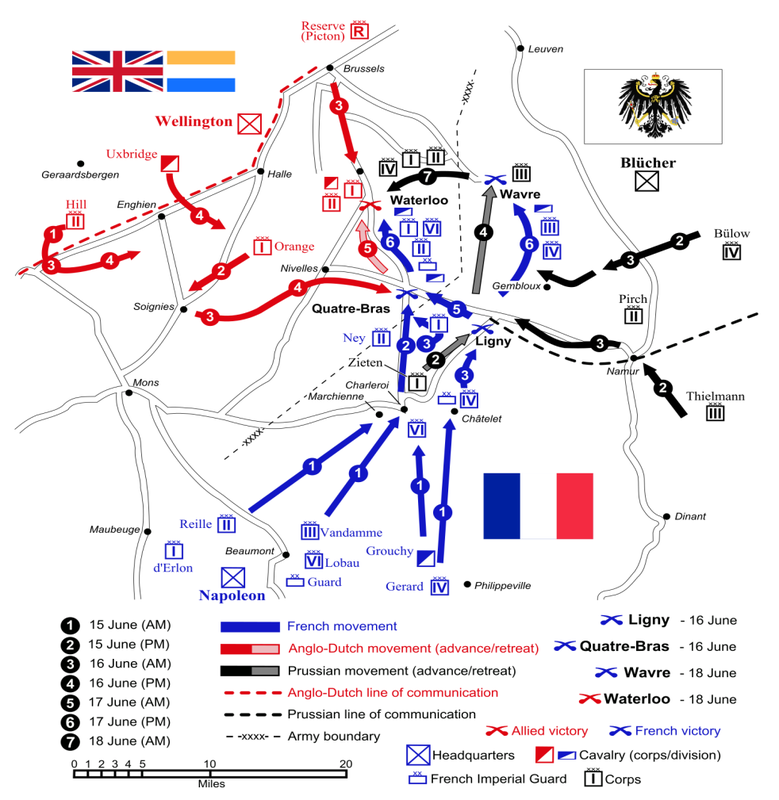 During the night of the 17th, the Prussians moved their main force to the area around the town of Wavre. The Prussian General Thielemann was blocked by the French units on the road from Namur to Quatre Bra. He, therefore, placed his men just north of the town of Gembloux. This is where Exelman’s dragoons found him earlier in the day. He then moves further north to join with Bulow’s corps outside of Wavre. At the same time that Grouchy was moving his forces toward the Prussians at Wavre, Bulow’s IV Corps was starting its march toward Waterloo. They were followed by II Corps, then I Corps and finally by III Corps. 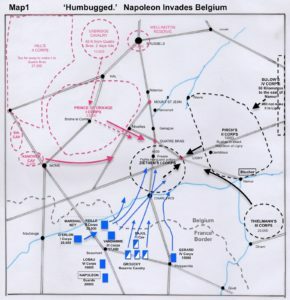 As Wavre was one hour’s march closer to Waterloo than Gembloux, it became impossible for Grouchy and his men to intercept or cut off the Prussian advances to the Waterloo battlefield. 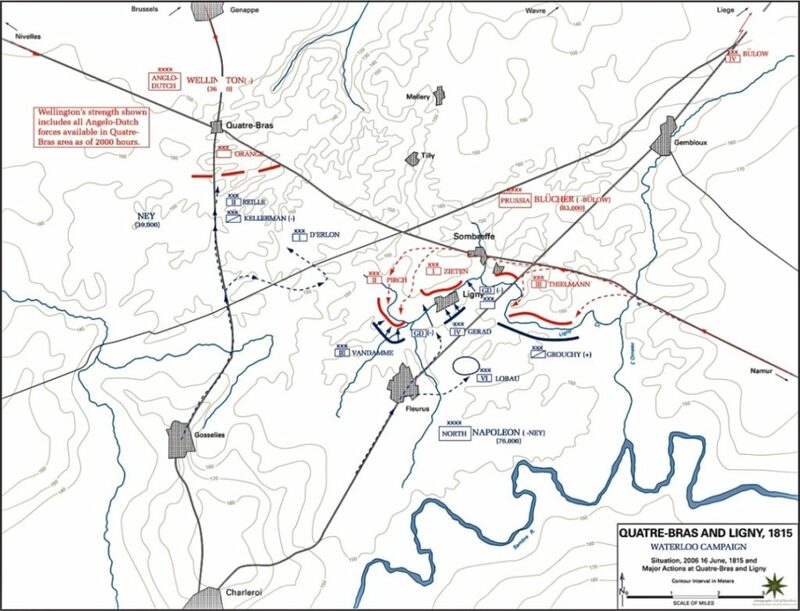 Although Grouchy had all of his units moving in the direction of Wavre by 10 am. he again gave orders that used only 1 road, thus causing additional traffic jams. At 11 am Grouchy sends a lengthy letter to Napoleon detailing all that he knows of the Prussian positions and their movements. He thinks that the Prussians are planning to join forces with Wellington just outside of Brussels. Even at this late date he seemed unable to grasp the overall tactical situation and there was now no way for him to prevent the junction of the Allied forces from the location that he occupied. The fighting at Waterloo begins shortly after noon. At the same time, General Gerard was having lunch with Marshal Grouchy when they heard the sounds of distant cannons. Gerard then tells Grouchy that should march at once toward the sound of the guns. However, Grouchy strongly disagrees. He states that their orders are to attack the Prussian force in and around Wavre. 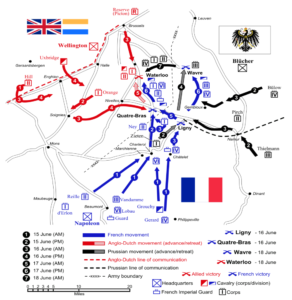 This will keep the French from moving in the direction of the fighting at Waterloo and allowed the bulk of the Prussian Army to move from Wavre to Waterloo late in the afternoon, just in time to turn the tide of the battle for the Allies. 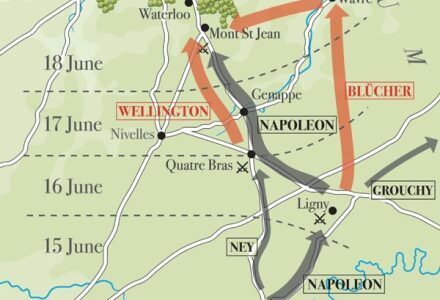 In summary, there were mistakes made by almost everyone on the French side during the 3 days of the Waterloo campaign. Napoleon was lax in his handling of his subordinates. Ney was not clear as to his mission at Quatre Bra. Grouchy was given too much latitude in the handling of his forces. 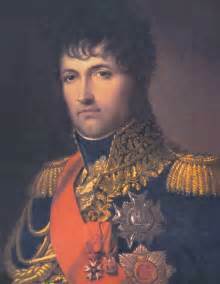 Napoleon also waiting until 11 am to begin the battle may have cost him valuable daylight and Soult should have never been given the job of Aide de Camp for Napoleon, as he wrote ambiguous orders and was slow in transmitting them. But Grouchy was the worst of the group. He was poor at handling his forces and repeatedly sent his force along a single road when there were many parallel roads available. He was not aggressive enough in his pursuit of the Prussians after the first day of fighting. He also lost track of their locations and spent much of the next day trying to find them again. And once he was engaged with the Prussian forces he refused to march in the direction of the main battle at Waterloo to help his Emperor. This lack of understanding of the overall picture of the forces engaged was the single biggest cause of Napoleon’s defeat at Waterloo. If Marshal Grouchy had been able to block the movement of the Prussians toward the battle, Napoleon would not have had to send the Guard to defend Plancenoit on his flank, and even without Grouchy’s men, he might still have defeated Wellington and changed the history of Europe. Corrigan, Gordon “Waterloo: Wellington, Napoleon and the Battle That Saved Europe” Pegasus Books Ltd. New York, 2014. Field, Andrew W. “Grouchy’s Waterloo” Pen and Sword Books, Ltd, South Yorkshire, 2017. Hamilton-Williams, David “Waterloo New Perspectives, The Great battle Reappraised” John Wiley & Sons, Inc. New York, 1994. Nofi, Albert A. “The Waterloo Campaign” Combined Books Inc. Conshohocken, Pa 1993.